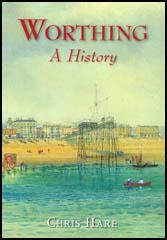 The first evidence of people living in Worthing is the discovery of flint tools made by people over 100,000 years ago. During this period the climate was very warm and these people lived by hunting and fishing as they had not learnt to grow crops or to domesticate animals like cows. These Palaeolithic people (Old Stone Age period) did not build homes and wandered over the coastal plain gathering plants or hunting wild animals. Over the centuries, the climate gradually became colder and eventually we entered the ice-age. Glaciers reached the region and the Channel became a narrow river. 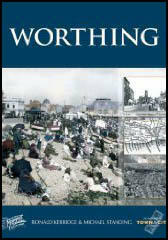 The climate was now sub-artic and people living in the Worthing area moved south in order to find a warmer climate. The land in Britain became cold, barren and deserted. It was not until another 30,000 years before the ice-melted in northern Europe. Further south the Palaeolithic people were ousted by the Mesolithic (Middle Stone Age). Some of these people began to settle in the south of England. The melting ice slowly raised the level of the seas, and around 8,000 years ago some of them became marooned on the new island of Great Britain. 3,000 years later Neolithic (New Stone Age) people came from the Mediterranean to live in the area. These people introduced agriculture, domestic animals and flint mining to Sussex. They also built the stone circles at Stonehenge and Avebury. The Mesolithic people who settled in the Worthing area made tools from flint. They discovered that flint splits into thin, sharp splinters called flakes or blades (depending on the shape) when struck by another hard object. This process is referred to as knapping. Flint was used to make knives and axes. At first, the Mesolithic people used the flint on the surface of the ground. However, exposed rock tends to be cracked or weathered and that they could make superior tools by obtaining flint from beneath the surface. The process of mining flints involved digging vertical shafts into the downland chalk using tools made from deer antlers and ox bones until they discovered a seam of flint. These mines, some as deep as 40 feet (12 metres), have been found at Cissbury Ring, Highdown Hill and Findon. In about 1,000 BC Celts from Europe arrived in the Worthing area. They brought with them the ability to make bronze. There is evidence that they lived at Cissbury, Highdown and Findon. 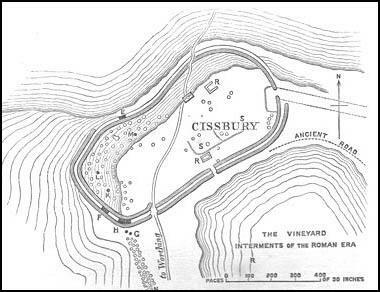 In around 250 BC a hill fort was built at Cissbury Ring. The ditches and banks at the fort are the remains of a defensive wall that protected an area of 60 acres. It is the second largest hill fort in England. Initially it was built to protect the flint mines but later farmers settled within the ramparts of the hill fort. In 71 BC, a tribe of the Belgae, arrived from mainland Europe and occupied large areas of Sussex. Sixteen years later, Julius Caesar led the first Roman invasion of Britain. In his book, Gallic Wars he described the people he conquered. "Most of the tribes living in the interior do not grow grain; they live on milk and meat and wear skins. All the Britons dye their bodies with woad, which produces a blue colour and gives them a wild appearance in battle. They wear their hair long; every other part of the body, except for the upper lip, they shave. Wives are shared between groups of ten or twelve men, especially between brothers and between fathers and sons." Herodian added: "For the most part the Britons are naked... being unfamiliar with the use of clothing. They tatto their bodies with various designs and pictures of all kinds of animals." Another Roman historian, Jordanes, pointed out: "They (the people of Britain) live in wattled huts, a shelter used in common with their flocks, and often the woods are their home." Cicero added "that there is not a scrap of silver on the island; there's no prospect of booty except slaves." Julius Caesar agreed with this assessment and he made no attempt to make Britain part of the Roman Empire. In AD 43 the Romans returned to Sussex. The Atrebates tribe led by Verica, who ruled this part of the country, accepted the greater military strength of the invaders and accepted Roman rule. After the death of Verica, Cogidubnus became the new leader of the people in Sussex. He was a great friend of the Roman Empire and was granted the honour of being made a Roman citizen. Cogidubnus was responsible for establishing Chichester as an important Roman town. The palace at Fishbourne, the largest private residence that has been found in England, was probably built for Cogidubnus. The remains of other Roman villas have been found at Bignor, Angmering and Highdown. Evidence of several Roman villas have been found in Worthing. This includes the site of Worthing Library in Chapel Road, on the eastern side of Grand Avenue, between Mill Road and Landsdowne Road, and in the grounds of Northbrook College. In AD 410, Alaric, the leader of the Visigoths, was strong enough to defeat the Roman Army and enter Rome. After roaming around the Roman Empire, the Visogoths eventually decided to settle in Gallia Aquitania. The Vandals, under the leadership of Gaiseric, also created serious problems for the Romans. With the support of the Alans, the Vandals entered Roman Africa from Spain in AD 429. The Roman Army had great difficulty in dealing with these invasions and Emperor Honorius was forced to withdraw his troops from Britain and abandon the land to the Celts. Over the next hundred years the Saxons gained control of the fertile lands along the coast in Sussex. Whereas the Celts had lived on the higher ground, the Saxons established villages close to a good water supply. This included Tarring, which was built on the banks of the Teville. Other nearby villages with Saxon names includes Angmering, Ferring, Goring, Durrington, Salvington, Lancing, Sompting and Worthing. Around 450, Highdown was being used as a cemetery by the South Saxons. Almost 100 hundred graves were found, possibly of Saxon warriors who died in the Saxon invasion of the area.